Microsoft said PC makers would likely miss the party, but HP joins Dell in begging to differ. Both companies say they'll be ready with Windows 10 machines on July 29. Microsoft said PC makers would likely miss the Windows 10 launch party, but HP said Wednesday consumers will indeed be able to have a shiny new Windows 10 PC in their hands on the launch date—as long as they order them now. “Customers can go buy Windows 10 machines on HP.com right now and you’ll have them on July 29th,” said HP’s Mike Nash, VP of product strategy and customer experience for HP personal systems. But those who want to waltz into a retail store and pick one up will have to wait a bit. Nash said only “select” retailers would have HP computers with Windows 10 preloaded by August 2. 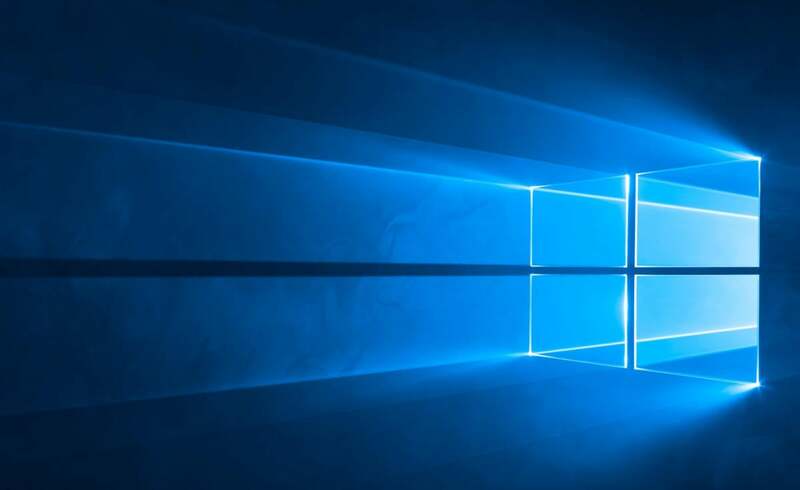 Why this matters: Microsoft poured some cold water on the highly anticipated OS launch this Monday by saying that it doubted PCs with the new OS would be available by the time the OS launches. That caused CEO Michael Dell to chirp up a day later that, umm, no, we’ll hit it. Likewise, Nash said HP is “ready” for the new operating system. Obviously, Nash said, consumers will have to order the new PC in time to get it by the launch date. Not all OEMs are quite as willing to say the same. Lenovo officials told PCWorld that Windows 10 machines will go on pre-order on July 29th, with ship dates a couple of weeks later. Lenovo also said PCs loaded with Windows 10 won’t be on store shelves until late August. Acer will be a little faster on orders. Officials also told PCWorld that consumers will be able to order Windows 10 laptops on July 29 with the units shipping the following week. Even Nash, who lauded Microsoft for being so open and transparent, dithered on the exact make and models HP will have available beyond “select devices.” But Nash said it’s just not a big deal. “No one should be freaking out at all,” Nash said. People don’t buy a new PC for one day, he said, they buy it to use over time, so even if it’s one or three days, it’s no big deal. Making this even less of a story, Nash said the machines are already ready. HP has worked very closely with Microsoft for two years on the operating system, Nash continued, and all of its machines sold this year with Windows 8.1 were designed with Windows 10 in mind. Nash said buying a new HP Windows 8.1 machine even today would essentially be the same as buying Windows 10, because the company made sure its drivers were in order. Even on a slow network, Nash said a consumer could have a trouble-free upgrade to Windows 10 in just a few hours. Nash, a former Microsoft executive who worked on Windows for 19 years, said the level of cooperation and transparency is unprecedented, which is why the admittedly short time between the final version of Windows 10 and the on-sale date isn’t a big deal. Still, we put it in a bar chart so you could see just how little time PC vendors have. 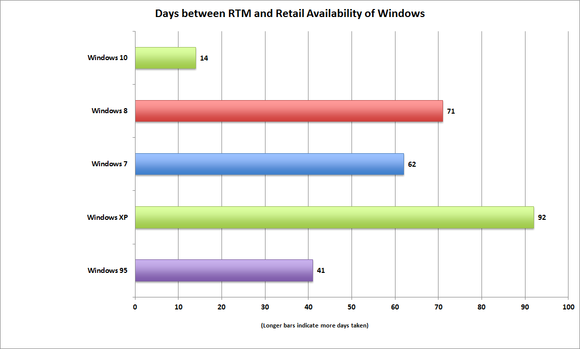 The number of days taken between RTM and retail release of Windows operating systems. HP would not confirm a news report that the new OS had gone “RTM,” which means the final version is locked down and distributed for manufacturing. But with the official date of July 29 looming, it’s clear this is Microsoft’s most aggressive schedule in history. Windows 95, for example, gave PC makers 41 days to get their builds in order, and Windows XP gave makers 92 days. If Windows 10 did indeed go “gold” or RTM today, that means PC makers have two weeks to make sure all of their drivers work and none of their applications or designs will break before going to consumers. Nash did say HP had “everything” it needed to do its final builds, which implies Microsoft had hit its RTM milestone.